Military was definitely one of the biggest trends on both sides of the Atlantic this season. 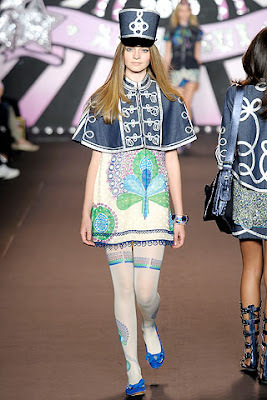 It had different permutations: from Anna Sui's humorous romantic take to Chloe's utilitarian approach. There is a lot to choose from if you want to emulate this trend: from vests, jackets, and coats, to hats, boots and body con dresses. I recently bought a gorgeous black military cotton vest from Zara (I think it was from the fall/winter collection, coz I grabbed the last one from the window display ;). 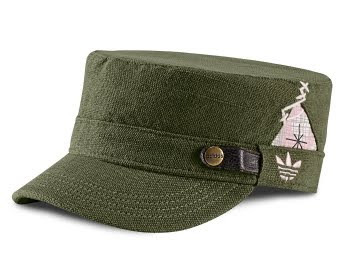 In the summer I plan to dig out my old cargo pants and pull on my Cuban hat I bought in Havana. Tip #1: check your wardrobe: I guarantee you have an old pair of cargo pants you forgot about! Tip #2: limit your military look to one piece: head-to-toe Balmain looks good on the runway – not in real life. 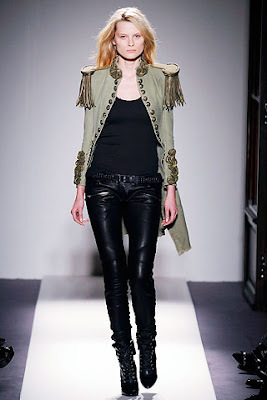 Tip #3: go for lasting effect: military coats are IN every season. You are guaranteed to get good mileage out of a quality wool or cotton trench coat. Tip #4: don’t take it literally: the above pair of officer pants by Kris Van Assche is a bit OTT. Tip #5: you can always turn to DIY by adding embroidery to your vests (see here), applying shoulder pads to t-shirts (see here), or simply sewing on gold jacket buttons. Tip #6: have fun: wearing a Cuban 'Viva La Revolution' cap is having fun in my book ;). I found that the best brands for the Military look are French Connection and Juicy Couture.